RUSH: Caroline, Corpus Christi, Texas, this is your turn. Great to have you on the program. How are you? CALLER: Hi, Rush. I’m just great. Oh, it’s quite an honor to visit with you. CALLER: Rush, I wanted to talk to you about the movie the American Assassin. I’ve listened to you forever, and I’m a big, big fan of Vince Flynn. And I’m kind of like you, I feel like I lost a dear friend when he passed away. Anyway, after listening to your review of the book, I have Netflix, and I thought, “Oh, I’ll just wait.” I couldn’t wait. I grabbed a ticket Saturday and went out to watch the movie. And I loved it. RUSH: Really? (laughing) And you didn’t know it! CALLER: I looked around and I said, “Oh, I hope no one sees me looking like this.” But it was a great movie. And, you know, I’m like you, I just felt like we’ve lost a great friend. I’ve read every one of his books. I put my husband on to him and my son-in-law, and they absolutely love him. And the other thing I wanted to tell you is we love your tea. So please don’t ever stop making your tea. RUSH: Oh, no. That will never happen. CALLER: And my son-in-law is a fan of yours, and so every Father’s Day he gets a supply of Rush’s tea. CALLER: The easiest gift I can give, Rush. RUSH: What is your favorite flavor? RUSH: Yeah. Isn’t that good? Isn’t that good? CALLER: And it’s so easy ’cause all I have to do is go to the computer and go boom, boom, boom, and he’s got the gift and sometimes, they live across the country and it’s so great if he’ll pick me up at the airport and it’s the middle of the day, he’s listening to Rush. RUSH: He is? That’s awesome. CALLER: And I have to say one thing. Being by myself now, if I’m in the car or I’m at home, you are my companion for three hours. RUSH: Well, God bless you. You know, I subconsciously know this. It’s how I treat everybody. I treat everyone like we’re just one giant group of friends or family or what have you. So I very humbly appreciate that. RUSH: Well, let me ask you a question about that. In the movie, Irene Kennedy is African-American. What was your reaction to that? CALLER: Well, I have no problem with her except I thought she was too young for the part. I kind of had Irene as an older person. RUSH: Yeah, I always imagined Irene Kennedy to be in her sixties and a doddering old sort of a schoolmarm type that was just brilliant. RUSH: You know, when they cast these parts, they’ve gotta think of who goes to watch movies. RUSH: And this actress was great in the role. CALLER: That is interesting, because I had Irene pictured exactly like you had her pictured. CALLER: And when I saw that I thought it’s just a little bit too young. RUSH: Well, I also had the benefit of being able to ask Vince. I said, “Is Irene Kennedy a looker or not?” He said, “No, no, Irene Kennedy is not. You shouldn’t think of Irene Kennedy. She’s a full-fledged lifer, professional intelligence official.” I said, “What about Mitch, who’s Mitch?” He wouldn’t tell me. He wouldn’t tell me who he had in mind for Mitch. It was a game. I always thought, if you saw Vince, he was Mitch. If you saw a picture of Vince, he was Mitch. I’m telling you, the guy was a stud. He had the burr cut, everything. He was just a stud. Anyway, I appreciate the call, Caroline. I really do. No, folks, I’m not — I totally understand the snark in the email. I kind of did step into that ’cause I was just being my regular-guy self here without any concerns for political correctness. I did ask him. We read the Vince Flynn books, you get to know Vince Flynn, you ask him about the characters, and Irene Kennedy is brilliant, she’s a boss. 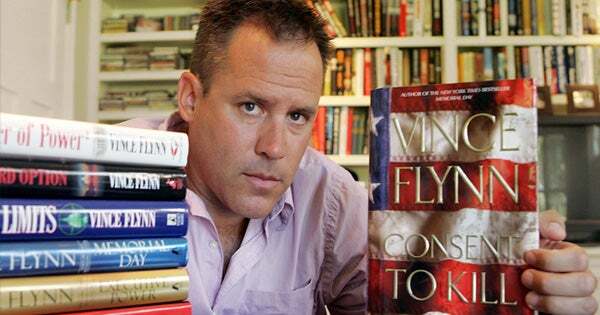 Vince Flynn looks up to here. It’s natural to ask, is she a looker? She’s a character in a book. There’s no picture there. I’m asking the author, what does she look like? I chose to ask, “Is she a looker?” Guys talk that way. I’m sorry, ladies, we talk this way. And you better be glad that we do. It’s what makes babies. Well, it is. I’m sorry. My dad told me that, and I thought, “What are you talking about?” It’s right. Anyway, I did not mean to imply that professional women cannot be attractive, nor did I mean to infer from Vince’s answer that. It was about this particular character, and that’s how he chose to describe her to me. She is. She’s a looker in the movie. She’s African-American. She is the boss. She’s the boss of a black ops unit, is what she is. She’s not the CIA director. Later on in the book she becomes the CIA director. She’s not in the early stages. But she runs the black ops unit, which Mitch is the predominant member of. And that’s who he loves and respects and admires. And it’s to the CIA director that Irene Kennedy goes to not ask, but to tell him what the black ops people are doing.